I am an Arizona native and the quote “If you love what you do, you will never work a day in your life” describes why it is a pleasure for me to be a Closet Factory designer. I enjoy the process of working side by side with my clients to create a custom project that fulfills their closet inventory, needs, and vision. Along with my interior design degree, I have a background in home staging, which allows me to assist clients in color choices and space planning. Being able to accommodate any space, from a small closet that needs every inch accounted for to turning large rooms into dream dressing rooms over the last two years has embellished my experience. Both closets carry different needs and can both benefit from the wide range products we provide at Closet Factory. Once we transform your space you will be amazed by how much more room you’ve gained in your closet and how much happier you are by getting ready in a freshly organized closet. When you are considering whether or not a new closet will make a difference to your space there are a couple things to consider. Think of your room as if it were empty, it may look like every inch is currently taken up. With a designer’s fresh eyes, we can take all of the pieces in your closet and reorganize them by designing a better layout that maximizes your space. Once the room is reconfigured and all of your needs are accounted for you will have more space to add extra embellishments. If you are having a hard time with color, take a look at the existing cabinetry in your kitchen or bathroom. 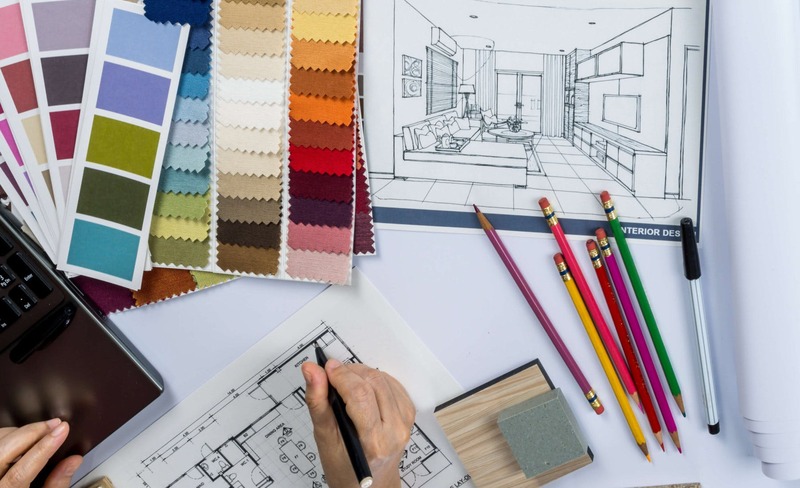 Matching the colors to what you already have will make your new design look like it was originally built with the home. These are some of the hurdles a designer like myself and can help you with! When my client shows me their closet space/storage problem for the first time, they usually have a sense of embarrassment at the moment, but the first thing I think of is “Wow you’ve really done a great job utilizing the limited closet structure that you currently have”. I have to say there are some very interesting ways to organize but it may not be very easy to access or see your clothes every day. 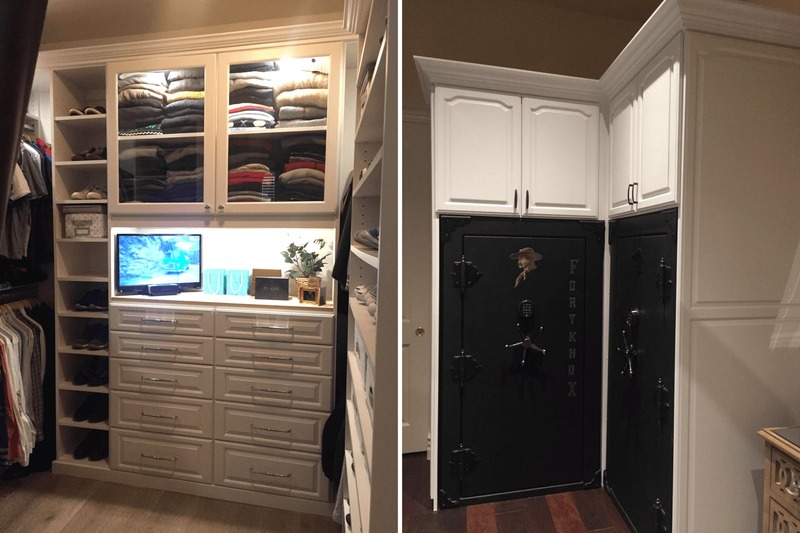 So first I focus on how I can maximize the closet space and make my clients morning easier when they are trying to find that one pair of hidden black work shoes before running out the door. One of my past clients thought for sure that they were stuck with the current closet system that they had. 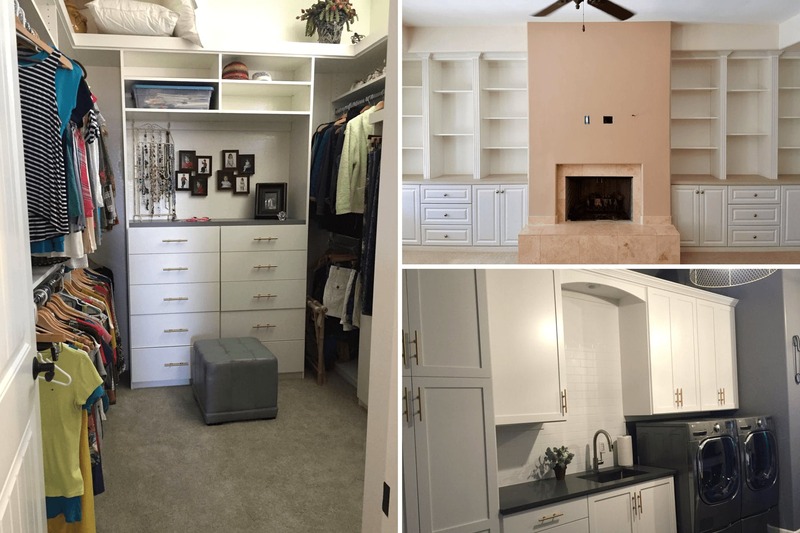 Before meeting these clients another closet company came into their home to give a design and quote and the other designer had told the clients that there was no way to gain more space in their closet. So they didn’t give up hope and called Closet Factory for a second opinion. The previous company had missed the opportunity to add a small shoe shelving section behind the door and make the entire closet system taller. It was hard for the clients to visualize the added space but by the time I walked them through the CAD 3D designs it made perfect sense. Once they moved all of their clothes back into the new closet she called me right away to tell me she could not believe all of the extra space they gained and said she was going shoe shopping for more! Since what we do at Closet Factory is very custom there are unlimited ways to design a closet but one appropriate way to design YOUR closet. 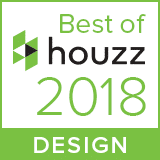 That is why we will ask you specific questions on your vision of the room, your wants vs needs, how you like to use the space, what is not currently working for you, and most importantly what you have set aside to spend on the project. Together we will come up with the best design for you. As you lead me through your home to look at your room in need, I take note of the style already integrated into the house. For example is the style traditional, contemporary, transitional, modern, etc. Through different colors and door styles we can either match cabinetry in your home or find a complimentary look. Also taking into consideration your wall and floor colors, we will make sure that the new style will not compete with your existing wood floor or wash out with your carpet color. There is a lot of moving parts to consider and you can rely on me as a designer to take everything into consideration. More and more people these days are working from home either part or full time. If you fall into this category then your home office is very important to you. I know because my job allows me the opportunity to work form home half of the time. 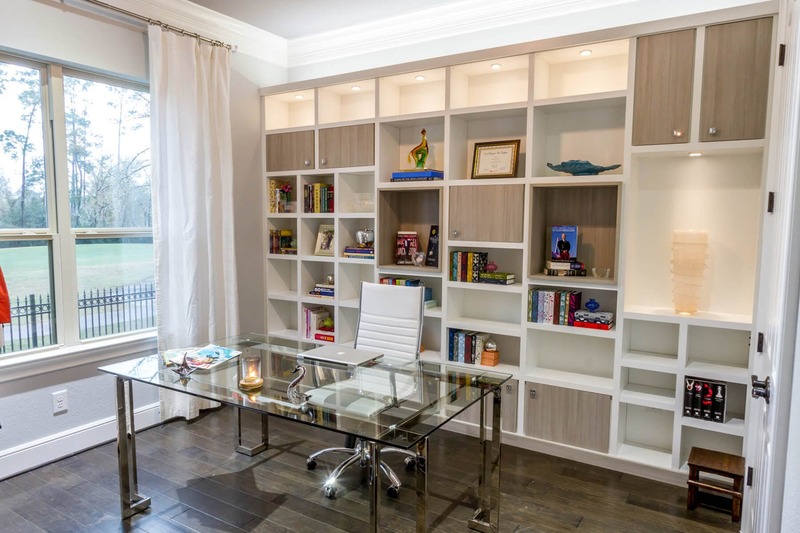 There are many reasons on how a newly designed home office can help improve your productivity. For example, I always look to see if there is a window or nice large opening for you to face in the room, being stuffed against a wall isn’t ideal. You may also have a stack of files piling up on your desk , I will make sure to ask detailed questions like “How many file cabinets you would like?” That way you can be organized and will be able to locate every piece of paper the next time you need it. 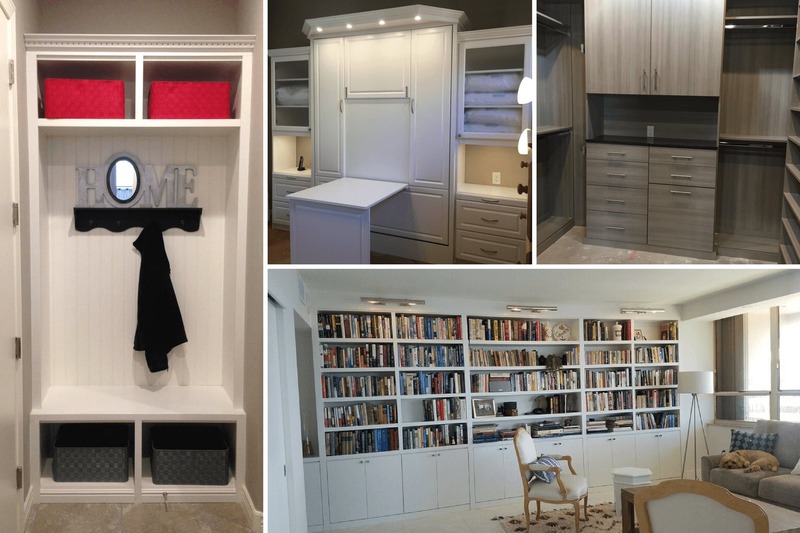 Lets say you are looking for a new closet or office but you are tired of the “old cabinetry look”. The trends have changed and the new style today is simple, clean, and modern. With endless materials at our fingertips at Closet Factory we can twist a standard raised wood grain cabinet into an oblong shaped high gloss modern piece of art that will still function as a cabinet. If you have an idea of what you are looking for or if you’ve seen some inspiring floating shelves on Pinterest 9 times out of 10 we can accomplish your vision.